After hiring a consulting firm that contacted more than 1,000 candidates nationwide, the California Coastal Commission voted unanimously last week to hire its interim chief as its new executive director. Jack Ainsworth has worked for the commission for 29 years, and over the last year, he served as acting director of the agency. Last February, the Coastal Commission voted 7-5 at a contentious meeting held in Morro Bay to fire its longtime executive director Charles Lester, who was widely viewed as an environmentalist. 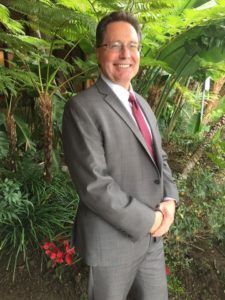 Lester’s firing prompted numerous accusations that the Coastal Commission majority, including Pismo Beach Councilman Erik Howell, is promoting development as the expense of California’s coastal environment. Following Lester’s firing, the commission hired CPS HR Consulting to conduct a search for a new director. The top finalists were interviewed during a marathon nine-hour period, a Coastal Commission press release states. “While all the candidates were extremely well-qualified, Jack’s depth of understanding of coastal issues, the challenges confronting this agency and his steady leadership over the last year has thoroughly impressed us,” commission chair Dayna Bochco said. Ainsworth, 59, is a San Bernardino native who is a career Coastal Commission employee and comes from a family of public servants. Both his parents were public servants, as were all eight of his siblings. The new Coastal Commission chief issued a statement saying he vows to protect California’s coast for everyone. Ainsworth’s position is based in San Francisco. He will received a base salary of $165,432 and will lead a staff of 156 employees at six offices from Arcata to San Diego. Lets’ be honest for a moment. Was this selection made based upon Mr. Ainsworth’s knowledge of California coastal issues, or his knowledge of how the “system” works having come from a family, interluding himself who has spent all of their lives working in government? I’m a bit concerned about nepotism. Ah, public “service” – such an incestuous bunch. As if being in a dysfunctional system for your entire “career” is bad enough, they go for the guy who was reared on the public teat. Swell. This out to work out splendidly. I wonder what was spent for the formality, to interview a 1000 candidates, only to stick with their home grown. If they can vote him out, why didn’t they simply vote him in? Don’t worry it’s was only taxpayer money, there is always more of it if needed. They had to “create” the illusion of looking for a qualified unbiased candidate. Exactly! More smoke and mirrors in an attempt to dupe the public into believing that government is working in our best interest.But of course we know better.